Pavlova. I wasn’t entirely sure what it was when a friend suggested it as a way to use up some of the bumper crop of raspberries I had posted a picture of. I had heard of it, but never had it. I vaguely knew what it looked like, but had no idea how to make it. I was intrigued. So, off to do one of my favorite things, research recipes! Pavlova, is a meringue based dessert, covered in fresh fruit, topped with whipped cream. Some recipes I found also included a lemon curd layer and / or a syrup made from fruit reduction. The trickiest part of making Pavlova is baking the meringue. The perfect Pavlova has a meringue that is pale in color, with a dry, crisp outer shell and a somewhat gooey, marshmallowy center. It’s a perfect summer dessert. Elegant looking, decadent, in a light and refreshing way, and pretty easy to master once you understand the potential challenges. It’s the type of dessert that will make you look like a baking superstar! As I mentioned earlier, the most challenging thing about making Pavlova is perfecting the meringue. It took me three tries. Avoid some of the pitfalls I encounterd by reading my lessons learned. Oven temperature. This is critical. This is what my first round of meringues looked like. Not overly brown, but far too crunchy. There was not a marshmallowy fluff in sight. They tasted good, but did not fit the bill of a Pavlova meringue. The problem was that my oven temp was too high. 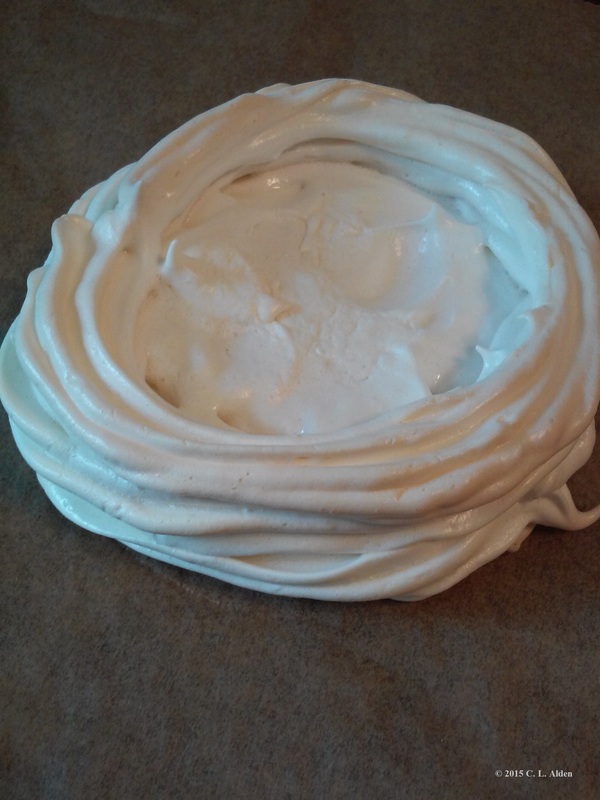 Meringues bake low and slow. Even though my oven was only at 250°F, it was too hot. If your oven runs hot, you may have to adjust the temperature during the baking time. Tip: Don’t open the oven too often. Use your oven light to check on the progress. Opening the oven causes a change in temperature that will activate the preheat mode, to bring the oven back up to the correct temperature, which could affect your meringue. My second attemp looked like a SUCCESS! I preheated my oven to 275°F and then turned it down to 250°F when I put the meringues in. I checked them about 7 or 8 minutes in and they looked like they were getting a little golden on the top, so I lowered the temp closer to 225°F. Time is another factor. Baking time for the recipes I researched all said between 50 and 60 minutes. I was a bit skeptical about that. It seemed way too long. I learned it does take that long. I tested them about 35 minutes in, and they were beginning to feel like they were forming a crisp crust, but they were still a bit sticky to the touch. 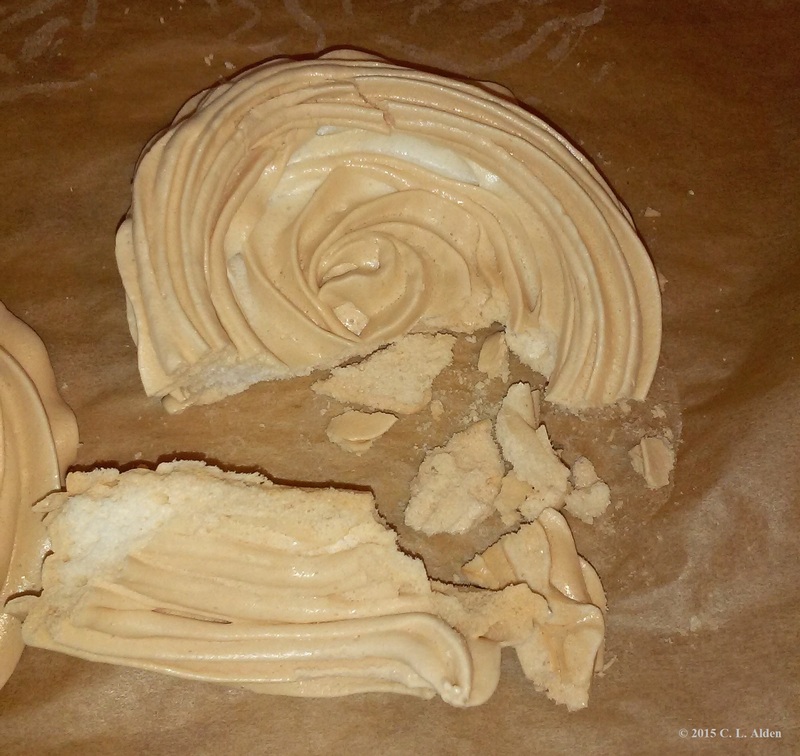 A done meringue will feel dry to the touch, but still have a spring. Keep in mind that they will crisp up further as they start to cool. What I didn’t take into account when baking these was the weather. Humidity is not a friend of the meringue! I baked these earlier in the day with the intention of finishing the dessert right before serving them. It was cool in the house, so I thought they’d be fine. I went out to run some errands, and when I came back and checked on them I found that they no longer felt dry and crispy. I didn’t have time to make a new batch, so I decided to try and salvage them. Right before dinner, I put them back in the oven at 225°F for a few minutes. When they started to feel dry again, I turned off the oven, opened the door a bit and let them sit in there. After dinner I took them out for assembly. They still looked great, but they had dried out too much. Some of them still had a little marshmallow texture in the middle, but based on the research I’d done, I knew they were overbaked. I served them anyway! Sometimes, in a pinch, you gotta just go with the flow. My family, having never had Pavlova either, loved them. A great dessert, but not really Pavlova. In hindsight, to counterbalance the crispiness, I might have added a fruit sauce – crushing some of the fruit in a small pot, adding a little sugar and water and cooking it down until it thickened. I would then cool it down quickly in an ice bath before serving. Me, being me, I couldn’t let this project go without getting it right. I needed to make a correct Pavlova. It had become my mission! The next day, I took what I had learned so far, and tried again. Thinking about perfecting that marshmallow center, I decided my chances for success would be greater if the nests were thicker. I was right! This time the meringues had a beautiful, light and springy, marshmallowy center. It was worth the work and wait! 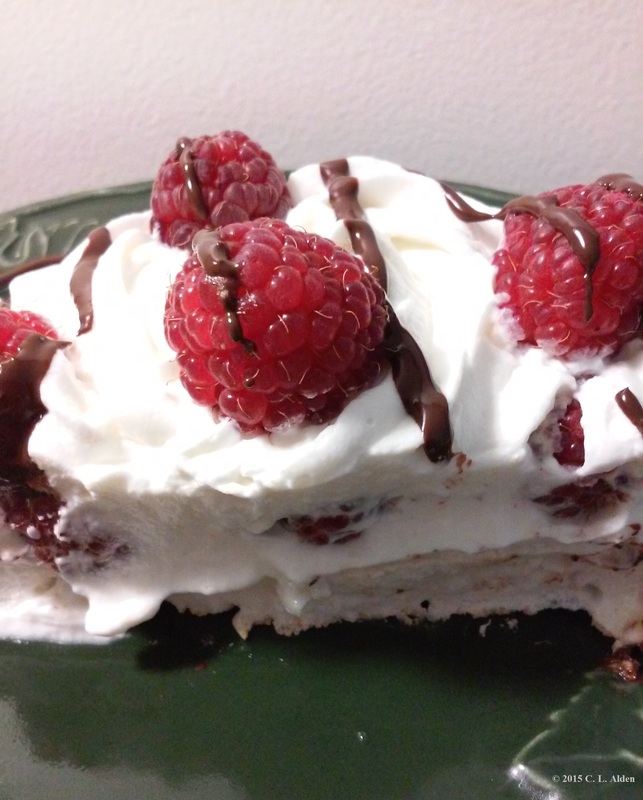 A little foreknowledge makes mastering the Pavlova easy! Get creative! Go ahead, and give it a try. The results will be delicious! You can use a variety of different berries or soft fruits. Try adding a lemon curd or a fruit sauce. Even a custard might be nice. Impress your family and friends! Or better yet, indulge and impress YOURSELF! You can do this! In a small bowl, combine sugar and cornstarch. Set aside. Combine vinegar and vanilla and set aside. In a large mixing bowl, add egg whites and salt. MAKE sure there is NO YOLK in your egg whites, or they will not whip up correctly. If you are using a stand mixer, use the whisk attachment. Beaters on a standard hand held electric mixer work just as well. Whisk on medium until egg whites start to turn white and look very foamy. Gradually start adding the sugar mixture and increase the speed to medium high. Continue to whisk until all sugar is added and you can no longer feel the sugar granules. Increase speed to high and slowly add the vinegar / vanilla mixture. Continue to be beat until stiff peaks form. Line a baking sheet with parchment paper. Using a can or cup, draw 4 – 4″ circles on the parchment. Using an icing bag (or snip the end off a gallon sized plastic bag), pipe, or spoon a meringue nest within each circle, making sure there is a well in the middle of each nest. Place baking sheet in the oven and reduce the temperature to 250°F. Set timer for 50 minutes. After about 7 or 8 minutes check on meringues. DO NOT open the oven if you can help it. If it looks like the meringues are starting to get golden, reduce the temperature to 225°F and check again after 7 or 8 minutes. 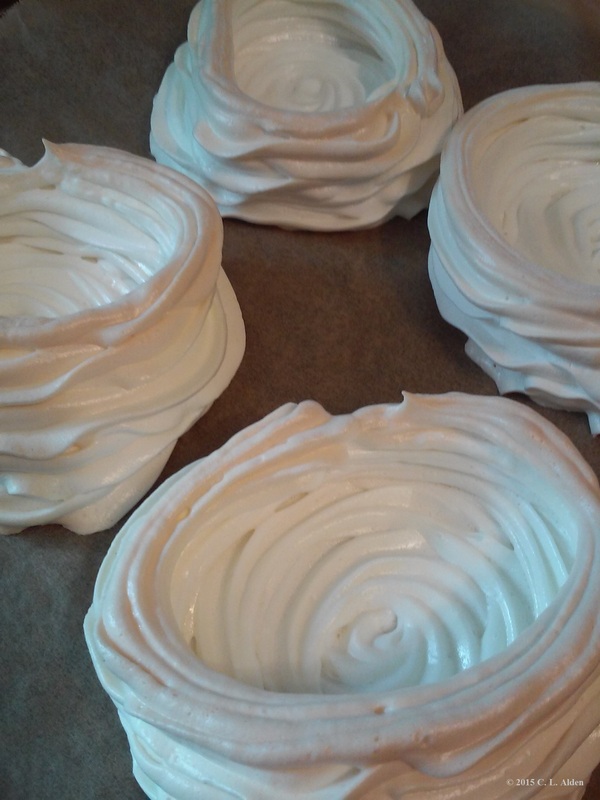 At the 35 to 40 minute mark, test the meringues by touching one. If they feel dry, kind of like styrofoam, but still springy, they are done. Remove them from the oven to a cooling rack, or if not using right away, turn off oven and leave it open, leaving the meringues in there to cool. If they are still a little sticky, continue baking until they feel dry to the touch. DO NOT OVERBAKE. Meringues will get crisper as they cool. While the meringues are baking, prepare fruit and Whipped Cream, and refrigerate till ready to use. In a large bowl add whipping cream and vanilla. Beat on medium until it gets foamy and begins to thicken. Gradually add sugar and continue whipping. Increase speed to medium-high / high and whip until thickened and peaks form. Refrigerate until ready to use. Melt chocolate chips in a bowl placed over hot water. If the chocolate is too thick to drizzle, try adding a couple drops of vegetable oil and stir. Pipe or spoon a layer of whipped cream into the center of each nest. Add berries / fruit. Add another layer of whipped cream, and then more berries. Drizzle melted chocolate over dessert and serve. If you are planning this for a dinner party, have the fruit (and sauce if applicable) pre-prepared. About 15 minutes before you are ready to plate the food or sit down to dinner, make the whipped cream, and put the meringues in. Keep the whipped cream in the refrigerator while the meringues are baking. Check the meringues after 7 or 8 minutes and adjust the oven temp if needed. Once they are done, turn off the oven, and leave the door open so they can cool, or if serving immediately, take them out of the oven, and cool on a rack. Cool completely before assembling. If meringues get too crisp, try adding a layer of curd / custard or make a sauce by crushing some of the fruit, adding a little water and sugar and cooking over heat until thickened. You can cool the sauce off quickly by placing the pot in an ice water bath. In a pinch, melt a little jam to use as an alternate for sauce. © 2015, C.L. Alden. All rights reserved. This entry was posted in Lessons Learned, Random Recipes, This & That by C.L. Alden. Bookmark the permalink.